Spring Newsletter 2015 - Authentic Designs, Inc. The landscape here has been buried under 30 inches of snow since January, but we are hoping for a gradual thaw this month of March. Cabin fever is slowly lifting, birds are starting to serenade each other here and there. In our little town, we can see the steam rising from the sugar shacks as the sap is boiled down to maple syrup. 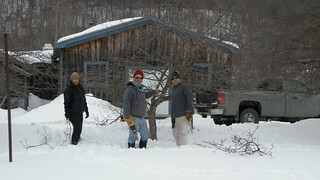 We've begun to trim the apple trees surrounding our shop, as you can see from the photos. We also pruned our website, spruced it up a bit and added some new parts we hope you find useful.